This collection of articles is written by some of the finest practitioners in children's ministry today. Each has a proven track record of providing training, help, and encouragement to those who serve children around the world. You'll find their insights understandable, valuable, and applicable.The contributors come from large and small churches. They hail from urban centers and rural settings. A… ll have cut their teeth in the trenches of children's ministry. Each provides unique viewpoints, teaching, and inspiration for the children's leader of any sized community or church. 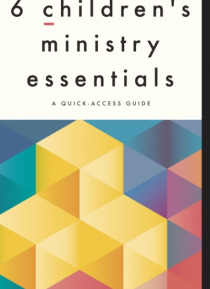 Each of the six chapters contains a wide variety of articles that relate to a singular topic of discussion:Nursery and PreschoolGender-Specific Children's MinistrySpirit-Empowered Children's MinistryOutreach and EvangelismKids and GriefVolunteersHere you'll discover a wealth of ministry-tested ideas. Some will be familiar; others will challenge you to take a step of faith. This isn't an all-inclusive book for the children's minister; it's a primer for the one who has served only a few months and a reminder for those who have served many years.